Once again, he says that the big three questions here that he was hoping that Hawking and Mlodinow would answer were not answered. KEVIN HARRIS: What about this that the universe will create itself because of a law of gravity? Spontaneous creation? Because there is a law such as gravity the universe can and will create itself from nothing? DR. CRAIG: Strauss criticizes that on the grounds that if there were really nothing then there wouldn't be any gravity. He says, “Gravity works within the space-time dimensions of our universe so it is impossible to invoke gravity as the cause of our universe.” The laws of nature apply within the theater or the arena of our space-time universe and therefore cannot explain why that space-time came into being. I think a more fundamental objection is that if there are such things as the laws of nature like gravity, what these are are propositions. They are mathematical equations of a certain sort and therefore abstract objects and therefore not causal. Abstract objects have no causal powers to do anything. So it is simply a category mistake to say that the law of gravity causes the universe to come into being because a law as an abstract object or mathematical equation doesn't have causal powers. This assertion that is so often made is simply a category mistake. These three questions touch on the very three reasons that I have argued give evidence for God from scientific inquiry. The first has to do with the origin of the universe in the Big Bang, which I claim gives evidence for a transcendent creator. I just got this article in a couple of days ago - “Big Bang Confirmed Again, This Time By The Universe's First Atoms.” This is from Forbes Science. Rather than go through this very technical article here, here is just more confirmation of Big Bang cosmology that just came in. If anything could throw the Big Bang into crisis, it would be if a truly pristine sample of gas disagreed with the predictions of how the elements should turn out. But everything lines up so incredibly well, between the theory of what we should observe just three-to-four minutes after the Big Bang and the observations we make billions of years later, that it can only be considered a remarkable confirmation of the most successful theory of the Universe ever. From the smallest, subatomic particles to the largest cosmic scales and structures, the Big Bang explains an enormous suite of phenomena that no other alternative can touch. If you ever want to replace the Big Bang, you're going to have to explain some tremendously disparate observations, from the cosmic microwave background to Hubble expansion to the first atoms in the Universe. The Big Bang is the only theory that can get us all three, and now it's gotten them to greater precision than ever before. So here he touches on the expansion of the universe, the microwave background radiation, and the abundance of the light elements – three empirical confirmations of the Big Bang theory of the universe. Of course, this is significant because, as Michael Strauss says in the article we have been looking at, the origin of the universe fairly cries out for the existence of a transcendent creator. KEVIN HARRIS: Ethan Siegel, who wrote this confirmation of the Big Bang [article], is an astrophysicist and an author. 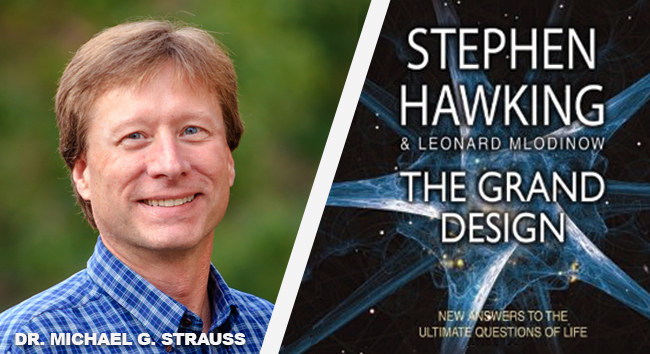 Michael says that this is a good book, The Grand Design from Stephen Hawking, if you want to talk about discoveries and some theories of modern physics, some quantum mechanics and things like that. But if you want answers to those big three that you just mentioned right there you are going to have to look elsewhere. The book has been criticized as being very sophomoric and disappointing. Their philosophy is just bad, and that has been the criticism that you've had and so many others have had. This book also talks about what Hawking talked about in A Brief History of Time and that is the no-boundary condition. DR. CRAIG: This is the answer to the first question “Why is there something rather than nothing?” which is really Leibniz’s question. Hawking and Mlodinow misconstrue this to be a question about the beginning of the universe. In fact, Leibniz’s question “Why is there something rather than nothing?” could be posed even if the universe were past-eternal. We would still want to know why there is a past-eternal universe rather than nothing, or why there is a past-eternal universe rather than one with a beginning? So the question “Why is there something rather than nothing?” is a much more profound philosophical question than “Where did the universe come from?”. DR. CRAIG: Right. Rather than go down to a sharp point like a cone, as you say it is more like a badminton birdie that has a rounded hemisphere at the bottom. What Strauss says is there is still this turning point so to speak where you quit going south and you start going north. He identifies that with the beginning of the universe. What is interesting is that in the book The Grand Design Hawking and Mlodinow also identified that with the beginning. They recognize that that represents the beginning of time and the universe, and that is a very different view than what he laid out in A Brief History of Time. But, as he says, he thinks his no-boundary proposal explains why that beginning point came into existence which is, as I say, absurd because there is no physics of non-being. Physics applies only from that beginning point forward in time. There is no physics of nothingness that would explain how the universe came into being from nothing at all. Rather, you need here a transcendent cause, and that transcendent cause cannot be the laws of nature because mathematical laws, as I said, are just abstract objects which are causally effete. To explain our existence on the planet Earth, Hawking and Mlodinow simply claim that there are many planets so one must have the conditions necessary to support higher life forms. DR. CRAIG: Here he is talking about life on Earth which is not an area that I have specialized in, but he quotes Hugh Ross' estimation of the probability of life forming on Earth (all of the necessary parameters that a planet must have in order to be life-permitting), and he finds a probability of 10-282 as the probability of finding even one planet capable of supporting life forms in the entire visible universe. So it is enormously improbable that there should be a life-permitting planet even in the huge expanse of the known universe. Finally, in regard to the laws of physics that seem to be finely-tuned to allow life to exist, Hawking and Mlodinow appeal to M-theory, the most recent and encompassing string theory. String theory proposes that the fundamental entities that make up our universe are "vibrating strings of energy." M-Theory – is that still around? DR. CRAIG: That is one thing that I am surprised in this article. M-Theory has failed to live up to its promises wholly apart from its application here in cosmology. This I don't think is at all a successful explanation of the fine-tuning of the universe. What Hawking and Mlodinow are doing is trying to generate a multiverse via M-Theory – to have a plurality of universes so that by chance alone finely tuned universes will appear somewhere in this multiverse. The problem is that M-Theory seems to be a failure. It doesn't provide you with this sort of multiverse that you need, and it would need anyway to be coupled with some kind of chaotic inflationary model that would produce the different universes. So it is really, I think, a quite desperate and unscientific proposal. What Strauss does not point out but I have argued in my published work is that this faces this Boltzmann Brain problem. The most probable worlds that would have observers in them (that is to say, the most probable observable universes) will be universes in which a single brain fluctuates into existence out of the vacuum and has illusory perceptions of an external world around it. That is far more plausible than a universe which is exquisitely fine-tuned for the existence of embodied conscious observers. So the Boltzmann Brain problem as it is called is a huge obstacle for any of these sort of multiverse theories, including those that would be based on M-Theory. DR. CRAIG: It is an absurd claim to think that the laws of nature presuppose that no supernatural being is interfering. No law of nature has that kind of codicil attached to it. The laws of nature are meant to apply in situations in which there is no sort of supernatural intervention. And if there is such a supernatural intervention the scientific law is not abrogated, it just doesn't apply in that kind of a situation. Many scientists and scholars who read the book The Grand Design were extremely disappointed that the arguments presented were poor and simplistic. In The New York Times, Dwight Garner wrote, "The real news about The Grand Design is how disappointingly tinny and inelegant it is." Once again, we see that the conclusions most consistent with the known facts from scientific observations and theoretical calculation are that the universe seems to have a transcendent beginning and seems to be designed with humans in mind, two ideas consistent with the teachings about the God of the Bible. This attempt by Hawking and Mlodinow in The Grand Design to circumvent such straightforward conclusions is entirely inadequate, illogical, and invalid. If you are looking for reasons to make God “unnecessary” you will have to look elsewhere. That is how he concludes the article. http://www.michaelgstrauss.com/2017/08/the-grand-design-is-god-unnecessary.html (accessed January 8, 2017). https://www.forbes.com/sites/startswithabang/2017/07/11/big-bang-confirmed-again-this-time-by-the-universes-first-atoms (accessed January 8, 2017).